Amazing, right? I was really, really excited about the all-surface paint. 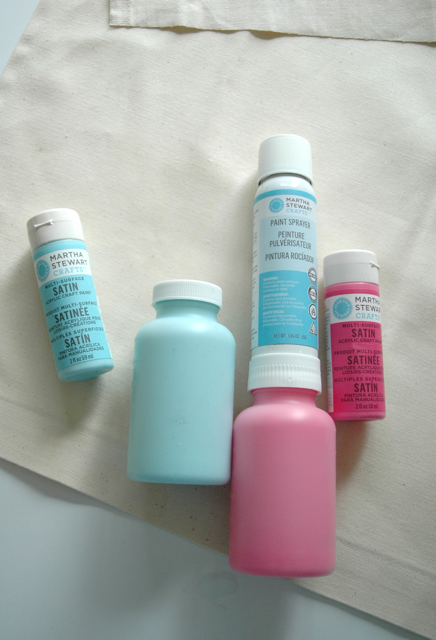 Paint that works on paper, fabric, canvas, glass, ceramics, plastic, wood… all in one bottle. 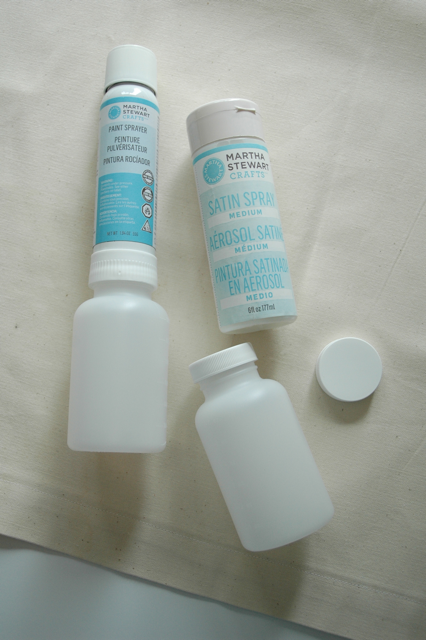 Have you ever bought glass paint? So expensive for something that only works on one surface! So I had all of these options and not a single idea in my head. I had 45,00 ideas that were all running together. So I called the craft help line. 1-800-co-blogger. I give her the run-down of what’s in the box and we talked about the sprayer and how cool it is. 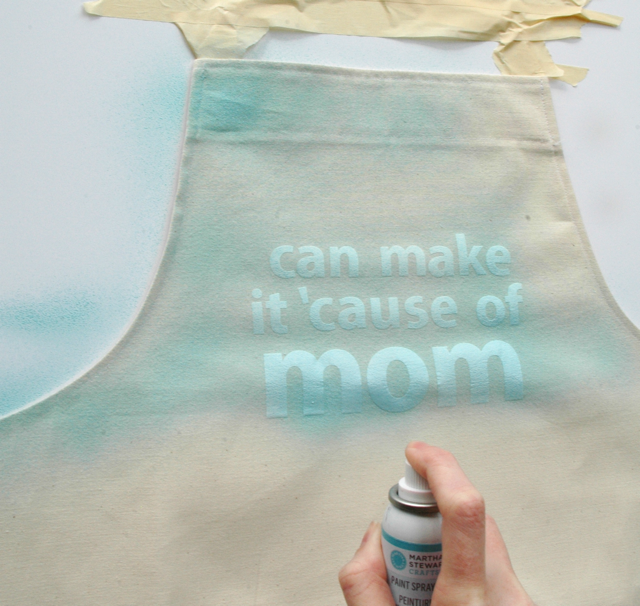 And Adrianna says “use the sprayer thing and a stencil’s negative space” or something like that. 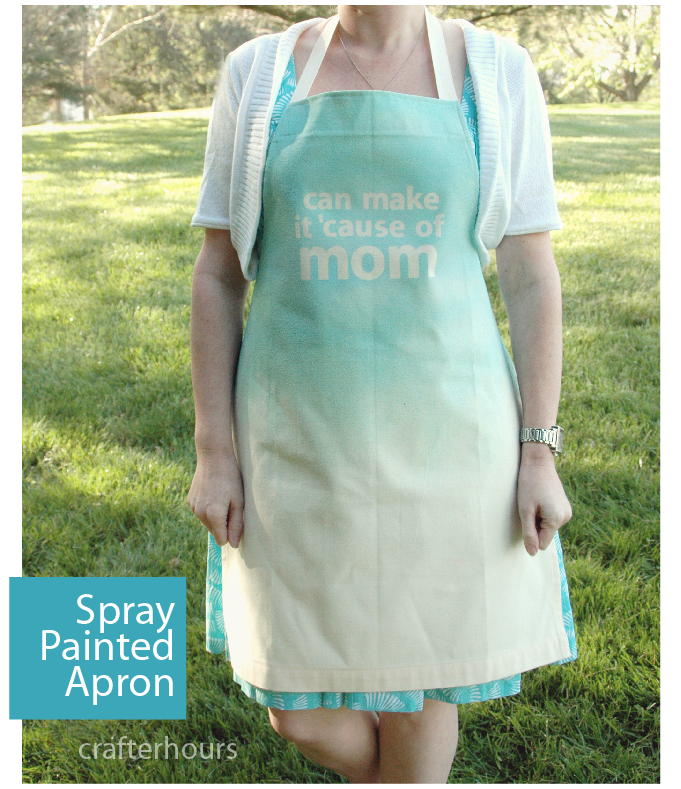 So, I made an apron. If you don’t sew, no worries. 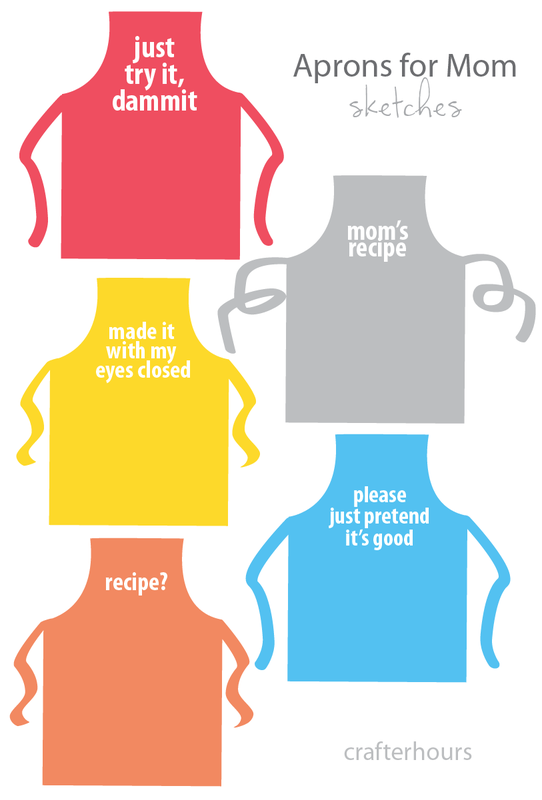 There are a million blank aprons out there that are ready to use. 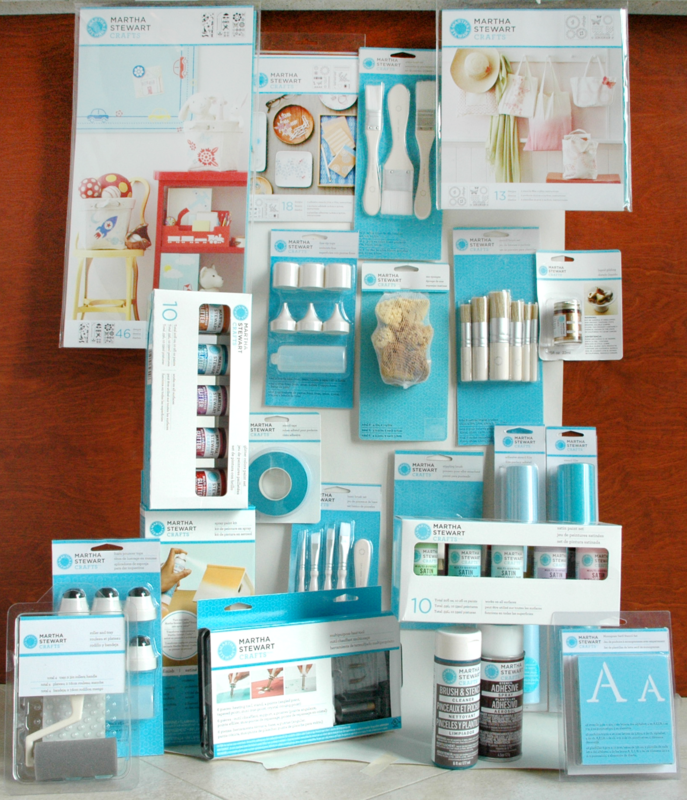 Craft stores and kitchen stores and general home merchandise stores are likely to have them. If you do sew, and want to see how I made mine, that’ll be coming up in the next week or two. 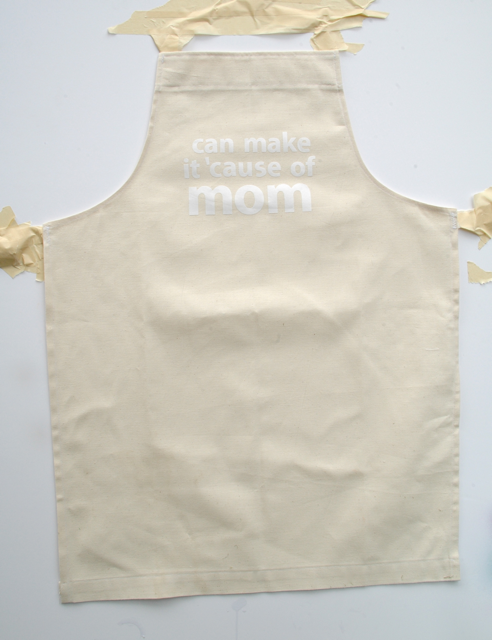 Here’s my apron. I considered all of the text options above plus a few others, and eventually picked one. I fit it into about a 6 x 8 rectangle. I picked kind of a sappy one. I was on the fence. 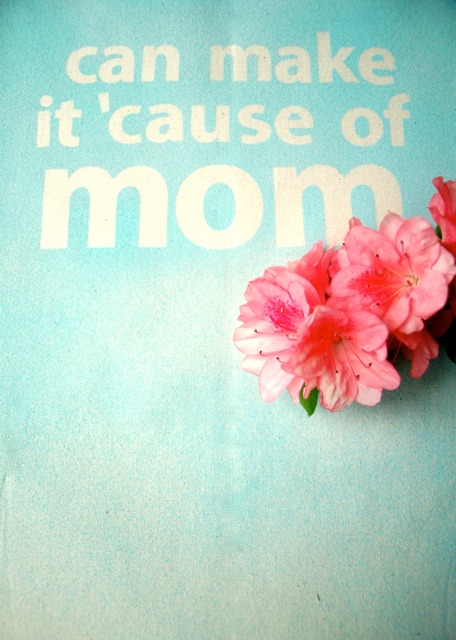 But when I think about it, and I’ve been thinking about it a lot lately, my Mom and Dad are in everything I do. We’ll talk about Dad later. 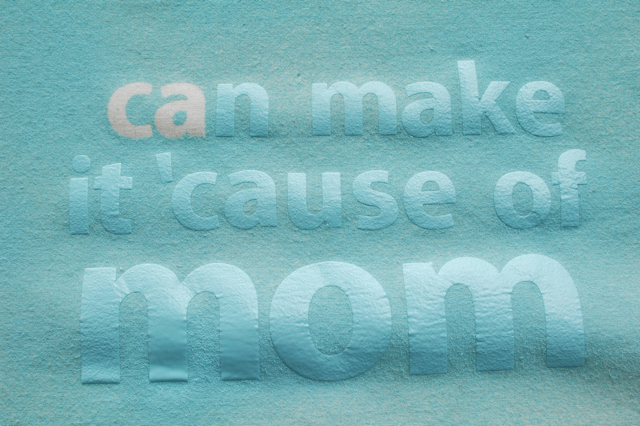 For now, let’s focus on Mom. She’s not all that artsy. Like, just barely. I think we both scratched our heads when I was young about where my artsy-ness came from. She’s a bit crafty, but mostly in a practical sense. So while she wasn’t my artsy genetic influence, she taught me to try new things and to keep trying until it worked. That’s pretty critical to who I am now. She also taught me how to use her sewing machine, left me alone with it to figure out what I wanted to do, and gave me supplies to play with. And most of the hard-copy recipes in my kitchen are hers. If I can make it, whatever it is, it’s probably because of her. So that’s what I chose. 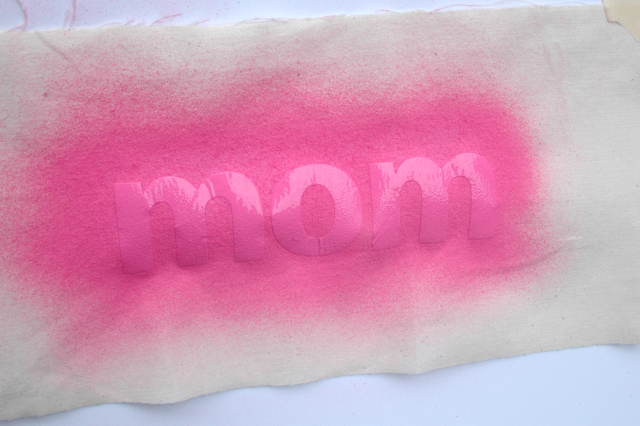 I used a cutting machine to cut these letters out of freezer paper, which you can find at most grocery stores. You can achieve similar results by drawing or printing on the paper side and cutting it out with scissors or a craft knife. Then iron the shiny side down onto fabric. While I was cutting the apron letters, I also cut some test letters. Since this was my first time trying the sprayer, I wanted to have something else to try it out on. 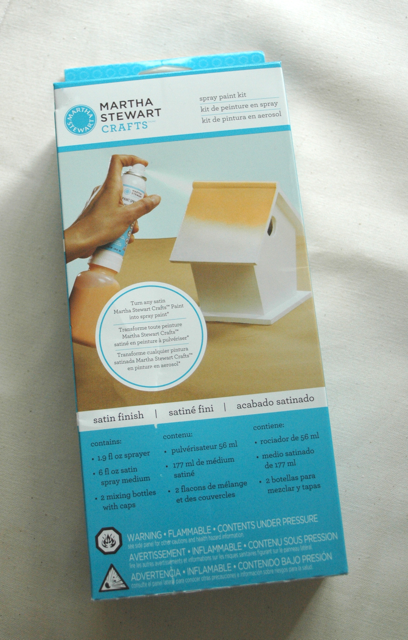 In the box: The sprayer, already attached to an empty bottle, an extra bottle, an extra bottle cap so that both of them can be stored after mixing, and the medium that you mix with your paint at a 1:1 ratio. It’s agonizing to choose paint colors. But I finally made it happen. 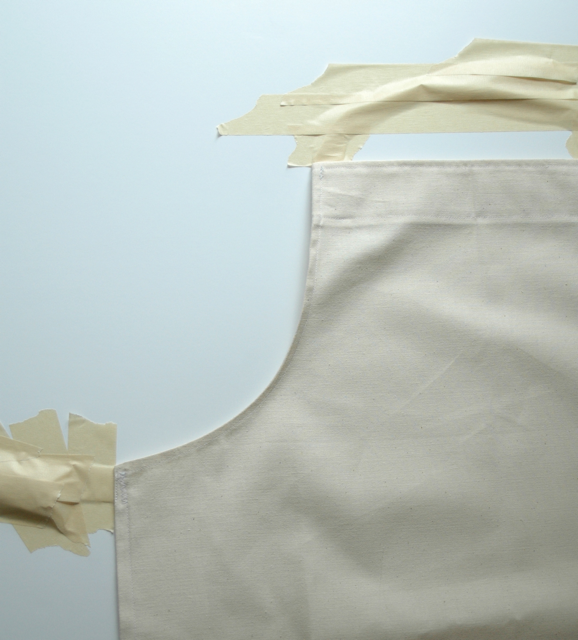 I decided I didn’t want the straps of my apron to be painted, so I masked those and taped my apron to a board that would stand upright for painting. Here’s my test subject. So far so good. Here’s the apron, ready to go. What I want to achieve is a gradient sort of effect. I were going for a solid look on fabric, there are other ways to do that. But for a gradual shift or an ombre effect, the sprayer is the way to go. There are two things to note about the sprayer. First, once the paint is added to the bottom, no shaking. You’ve got to shake and mix the paint and medium before you add the sprayer. I shook it out of habit, expecting a little ball to be shaking around in there or something? And that was not helpful. Second, the red spraying nozzle has to be lined up with the “V” notch in the paint cap. Once you’ve tested it somewhere other than on your project, you’re ready. Since I hadn’t managed not to shake it, it took a bit for the sprayer and I to get things worked out, but we made our peace and got to work. 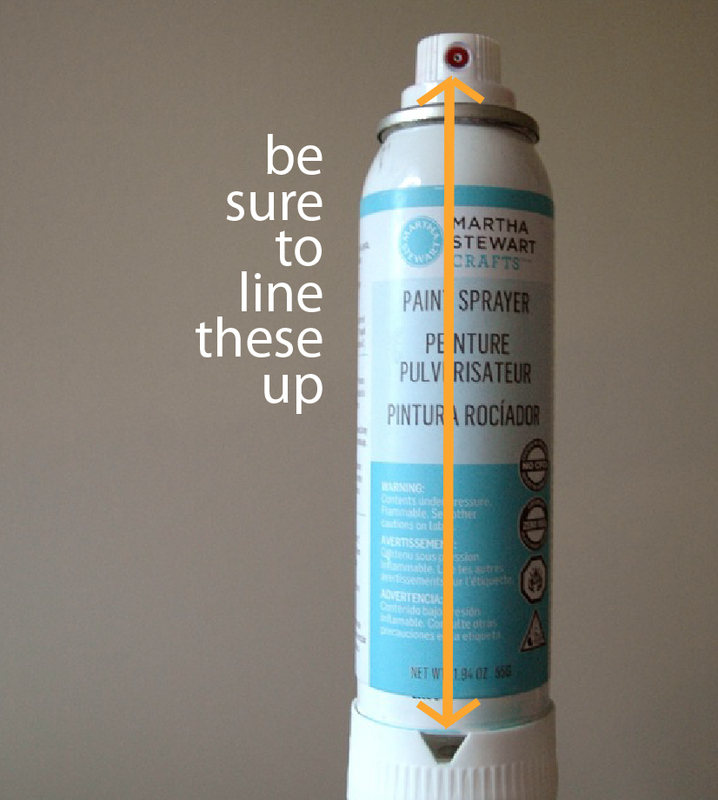 A tip for any kind of spray painting– unless you’re going for the blotchy, drippy look, always start off to one side and sweep into your work area. Wherever you start spraying there’s likely to be a blotch or drip or both. Although this sprayer is more gentle/subtle than the regular cheapie stuff. Until I felt I had solid enough coverage over the lettering that it would be attractive and reasonable, and a nicely graded feel to the rest. And then the peeling. 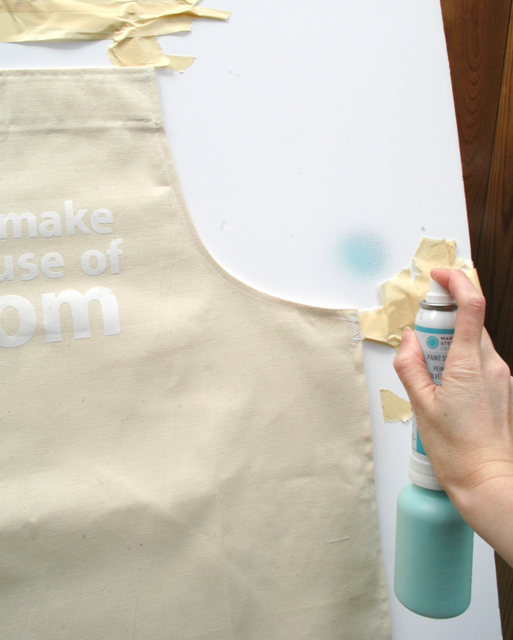 Peeling a freezer paper stencil is so so SO satisfying. I don’t think I can wrap up a Martha-related project without a few flowers. 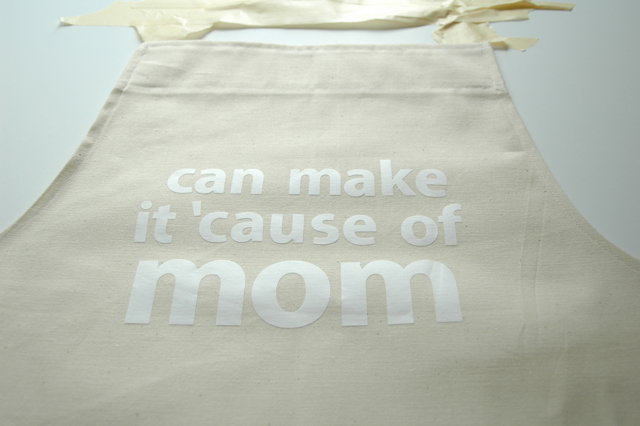 And sharing the thought that yes, my Mom has helped me make things. But also make it through. I wrote this post as part of a paid campaign with Plaid and Blueprint Social. Super cute!!! Did you realize it’s also Martha blue? It’s kind of like a subconscious nod to the queen. I think it seeped into my brain. Also, my Mom’s favorite color is yellow. I don’t think that would’ve worked so well for this. What fun!! It turned out very cute. The spray option is intriguing… Now, what are you going to show us next? Oh, the PRESSURE. :) I’m not sure myself. But I know I have pleeeenty to work with! Oh wow, if Martha tells you to do it, you better do it! BTW, you did a gorgeous job, I love it! I am totally gonna have to go stalk out those products now too. beautiful and a sweet sentiment, too! I think my words would/should say: Eat it or do without!! Only because I say that quite frequently. Great idea! Squeal!!!! that spray paint kit is awesome! So is the apron. Great idea!! This is super cute! 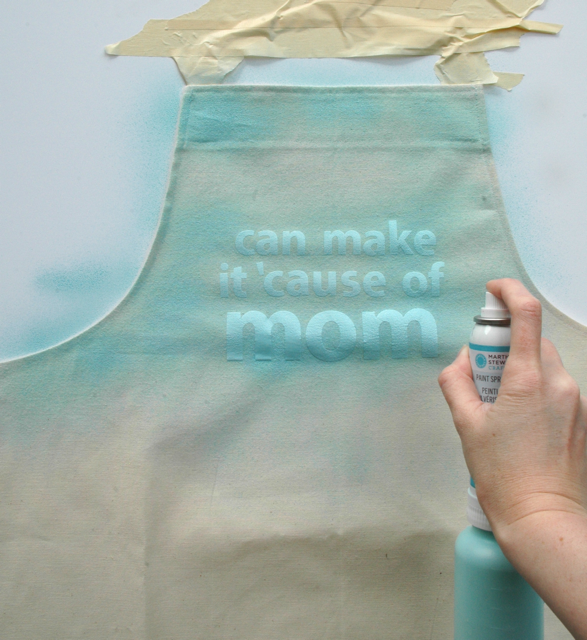 I made freezer paper stencils a few years ago with my kids, but I forgot all about this technique until I saw your post. Good grief Martha sent you a package!? And a note??? Wow girl! Love what you did with it! I have used her glitters, love em. Will have to check it out! Sigh. Wouldn’t that be so amazing? It was really the Plaid people. But I love them too for sending it. I, too, have her glitter and love it. I’ve been coveting the “tinsel” glitter. Who knew there were so many shapes and sizes of glitter specks? Martha. That’s who. You know what’s weird? I looked in MY mailbox today…and there was NO box from Martha! Sheesh! Really love the ombre! And the reverse letters – seems somehow fresher than the other way around. Great tutorial! Oh dear, that is super cute! I too love the ombre! That looks like so much fun! I LOVE looking at her stuff at the craft store. So addictive! beautiful and a sweet sentiment!